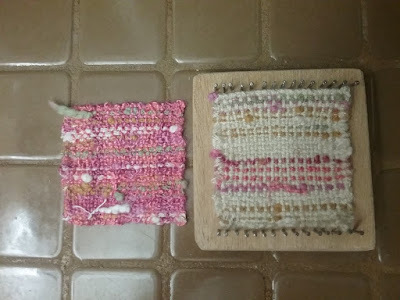 Last week, when talking about the washable make-up removal cloths that I was knitting, I mentioned that I had an idea in mind for the packaging. Well, here it is. 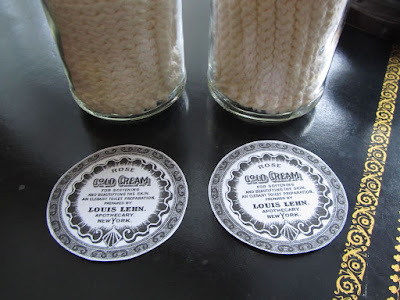 I used glass peanut butter jars and lids, a couple of knobs leftover from a furniture refinishing project, some brushed silver spray paint, and apothecary labels made with free vintage images from Graphic's Fairy. 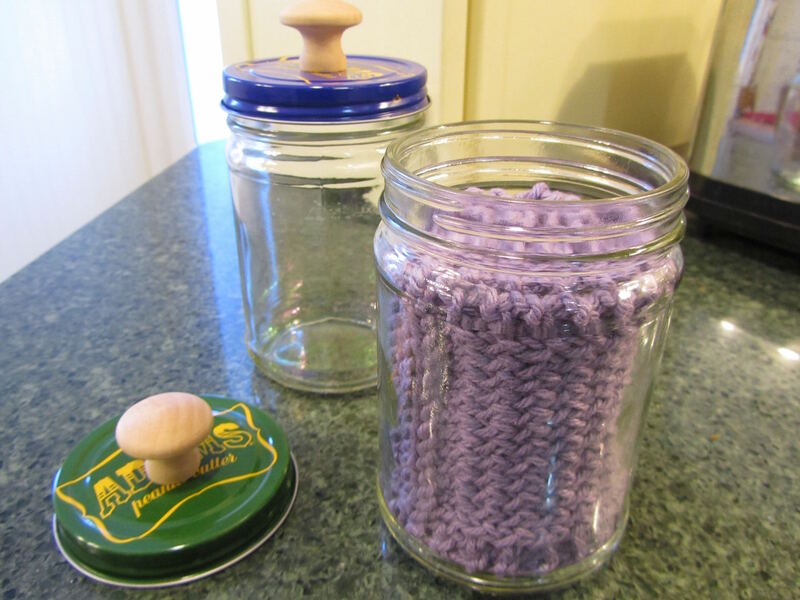 My thought is the cloths could be stored in a stack in a drawer, and the jars can be used to store the damp cloths after they have been used before my daughters add them to their laundry. 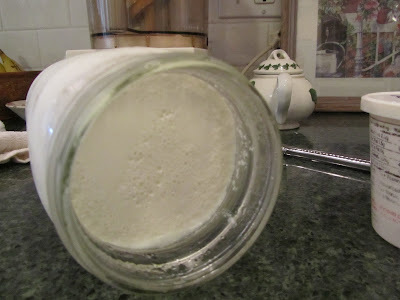 After scrubbing the labels off the jars, I began working on the lids. 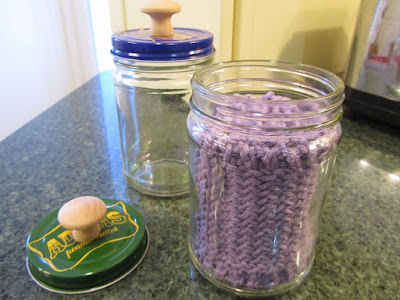 I think the hardest part of the jar makeover was attaching the knobs to the lids. I used a nail and hammer to punch a hole in the center of each lid, then found screws which would be short enough to work with this application. The screws that generally come with cabinet knobs are long enough to pass through a thick panel on a drawer or door front. That long of a screw would be too long for the thin metal of the lid. So I scrounged screws from a box of nails, screws, bolts, etc. Once the knobs were attached to the lids, I gave them a couple of coats of spray paint. I didn't have a lot of choices with the spray paint. My first choice had been white, but apparently I used all of my white on my last white project. So, my choices were limited to brushed silver, black, brushed gold, glitter purple, and glitter black. I went with the silver, but I also think the black might have looked nice. I sprayed the lids in the very cold garage, so the paint took extra long to dry. Meanwhile, I began working on the jar fronts. I searched Graphic's Fairy for vintage apothecary labels. They have a pretty decent selection from which to choose. 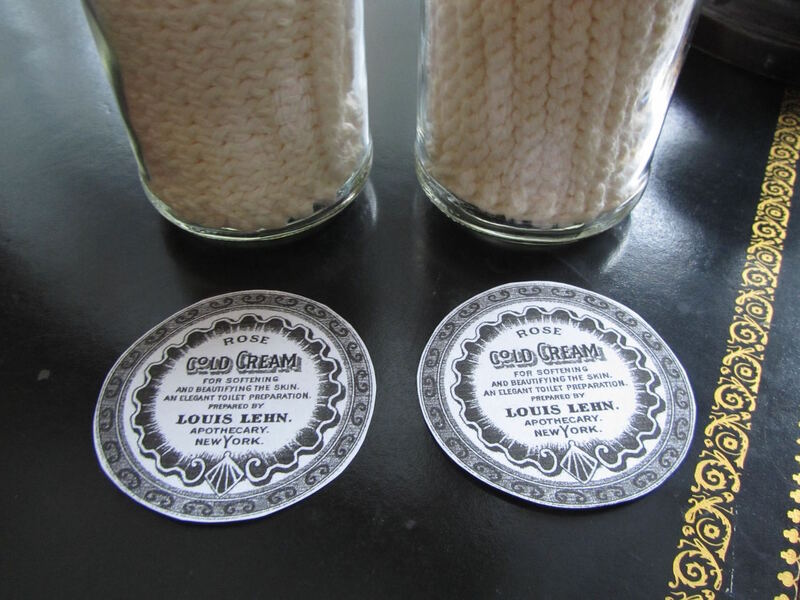 I settled on this Cold Cream label. I printed the label onto ordinary copy paper, cut out, "laminated" with mailing tape, and adhered to the jars with contact cement. I had planned on dyeing the natural-colored cloths a peachy pink. However, I had a difficult time with the dye. I was using some of the remaining pink and orange dye powders that I also used on the set of bath towels, but the dye job turned out splotchy at best. It was frustrating. After a couple of hours of adjusting the dye, I gave up and removed the dye and lightened the natural to a creamy white. I think they look better, now, as a shade of cream, than they looked as ecru. 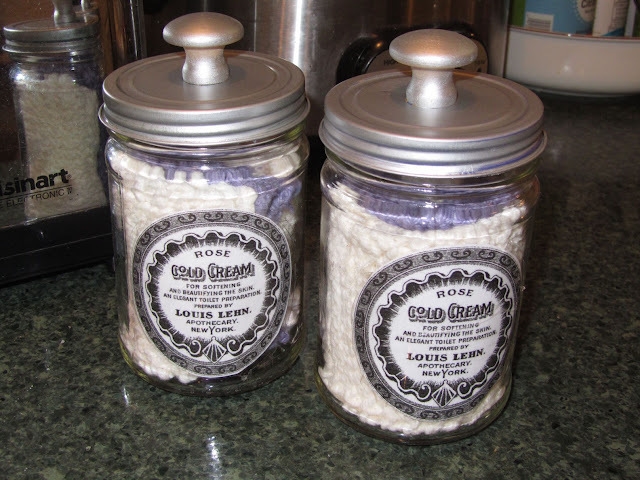 I mixed the lavender cloths with the cream cloths in each jar. I had thought I would give one color to one daughter and the other color to the other daughter. Changed my mind on that when I couldn't achieve a good dye job on the natural ones. To go with the cloths, I have two bottles of make-up remover. I went with commercial facial cleanser, but I did check into recipes for DIY solutions. Maybe another time I'll try one of those recipes. 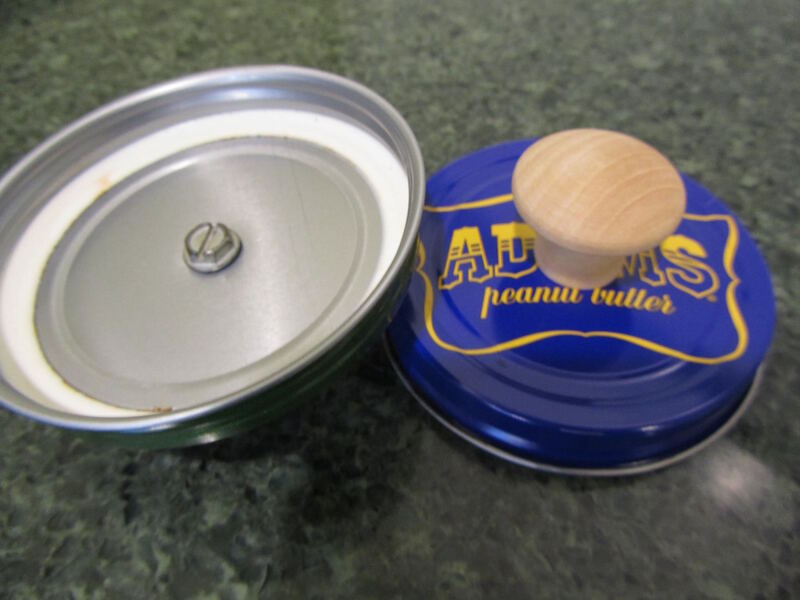 By the way, I am planning on using this idea with the lids to make a couple of canisters for the kitchen counter. I keep instant coffee and cocoa mix on the counter, but the jars could use a little decorative improvement. I'll post photos when that little project is completed. I also wanted to share a photo of some woven squares that YHF has made. YHF is a textile artist, and I think her work has considerable aesthetic appeal. In the comments last week, YHF mentioned the loom that her husband made for her, and the possibility of weaving make-up removal squares. 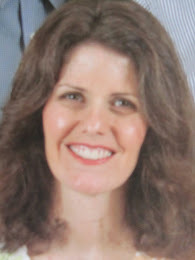 Here's a sample of her work. Beautiful, don't you think? Lili, you could sell those jars! Gorgeous! 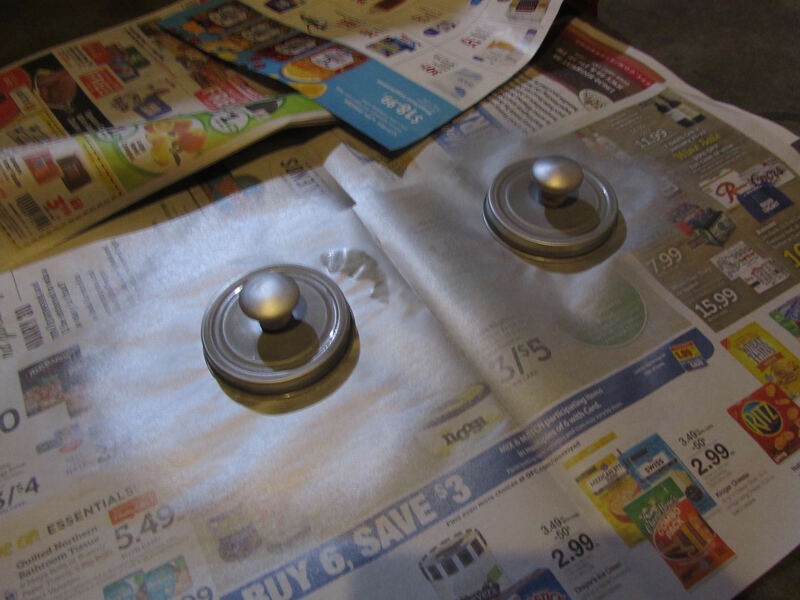 I think the silver paint is perfect. YHF, your woven squares are pretty. You have endless color options! YHF, your squares are lovely. Great texture!Thank you for sharing! Lynn - Some natural or organic peanut butter is still packaged in glass jars. Adam's Natural peanut butter still is packaged in the glass jars. But the Fred Meyer brand of natural-style is in plastic, as you've experienced. I get peanut butter from a vendor that makes the peanut butter straight from peanut fields which is all natural. (Big peanut growers here in my part of north eastern NC) Unfortunately, it is packaged in plastic:( Oh I agree-far less ways to recycle and reuse the plastic packaging. And here, if you do recycle glass, it winds up being single use only as they grind it up to use like gravel, so "end of the road" both literally and figuratively. Makes me crazy. How frustrating for them to use plastic. It's a shame that glass jars aren't recycled the way soda pop bottles and milk bottles once were. Like, Lynn, I haven't seen glass peanut butter jars for a long time. Are these ones you've had on had for a while. Anyway, I love what you've done with them, especially the lids. YHF, thanks for sharing your squares and loom. I a like both of them. These jars are from about 2 years ago, when I found a great sale on Adam's peanut butter. But I've seen the Adam's peanut butter in glass jars in the store recently. It's sad that so much comes packaged in plastic containers. While plastic is lighter in weight, and unbreakable, compared to glass, the plastic doesn't have as much reuse potential for me. Wow! That's absolutely wonderful, thanks for sharing this! Very nice! Your girls will love the jars and cloths. YHF, the woven squares are very pretty. Thank you, Angie. I hope so. I always love your ideas and this just may be my all time favorite. Thank you, Nancy. That's such a nice thing to say. Thank you, Lili and everyone too, for your kind words. I only wish I could be a textile artist, which I am not, though I think Lili may have remembered my angst from a few years ago that I wish I had the talent and courage to have studied art in college. I certainly remember her encouraging words. Really, these squares are so easy to make, it is instant success for a beginner like myself. I watched a you tube video from Noreen Crone-Findley on clasped weft technique. I think she was the one who recommended constructing homemade looms with simple pieces of wood and finish nails (This one is a 3in square.) Using this technique, color change is very easy, and also thrifty since the shortest length of yarns can be used. It is easier and more interesting than traditional weaving, Besides this simple homemade loom, the only other tool is a crochet hook. Such a good idea turning glass jars into pretty jars, using a drawer knob and a can of spray paint. The vintage style label is the perfect finishing touch. So much love and care in all your gifts, down to the presentation, that's what sends the message to the recipient that they are worthy of being given that precious gift.